Recently Microsoft has pushed a new update out to its Windows Phone 7 users. 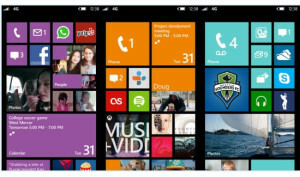 It is not Windows Phone 8 like we were hoping, but at least they decided to throw us a bone. Sprint decided to block the update to its users running the HTC Arrive like me, but there are ways around them, thanks to Microsoft releasing the updates to the public. As far as the backend of software goes not much has changed, but the front end got a pretty major upgrade. As you can see in the picture above you can change the size of your app tiles, so they can show you more or less info on what is going on inside that app (like little Windows go figure). It makes the screen much more personalized for the individual, instead of a boring row of lifeless icons. The front screen is pretty much the only difference, but there are a lot of bugs that have been fixed: My power button that was acting up is working, so that is pretty great, and I get a longer battery life which is always appreciated. All in all it is a solid update for old phones, so if you have an old Windows Phone you should defiantly find a way to update it. I am glad I went with Windows Phone for my device. It keeps me updated on my info with one swipe. It doesn’t have that Toyota Corolla feel of an iPhone, and it is not one of the myriad of Android devices.